Austin Aerial Skyline Twilight View - Austin Aerial skyline picture at Twilight taken from a birds eye view. 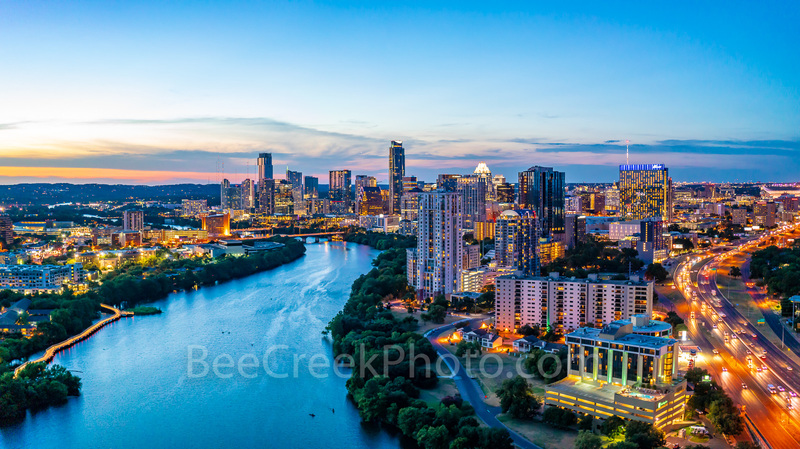 This is another aerial image of the Austin skyline twilight view looking down Lady Bird Lake with the city modern high rise buildings along the shoreline of the lake and looking north over IH35 where you can see the UT stadium and Erwin Center in the distant view. You can see Austin tallest building the Austonian which for a few months longer will hold that title till the Independent is completed sometime before the end of the year. It has been hard to capture images of Austin skyline from anywhere along the hike and bike trail because they are constantly adding new building along the shoreline. About the time you think they are done new cranes show up. Just recently found out that we will have two new buildings along the town lake shoreline once more and they will be taller than the Independent so its title will not last long. Just like all good things they don't last long you can barely see the top of the Frost building, at one time it was the tallest building in the skyline. The cityscape has been constantly changing for years and I guess until all the land is gone it will continue. Actually from this spot in the 70's you had a straight on view of the Texas Capital those days have been gone for many years now but you do get a peep of the top of the dome of the capital in this image. Photo © copyright by Bee Creek Photography - Tod Grubbs / Cynthia Hestand.